PHOTO CAPTIONS: 1. 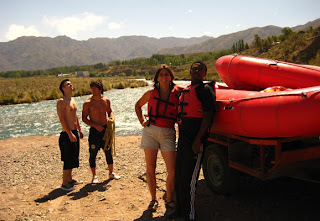 Andre and I ready for rafting, 2. Andre in action, 3. 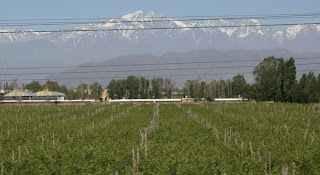 Andre's first glimpse of snow on the Andes, above a Mendoza vineyard, 4. a taste of home: Mexican food, 5. reminiscing about Daniel's and my former business, El Kiosko, 6. 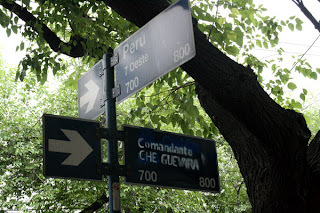 Some clever liberals changed the Avenida Colon (Columbus Ave.) signs to Comandante Che Guevarra, 7. Mendoza tract homes looking a lot like San Diego county, 8. & 9. Military statue on a mountain top above town, 10. 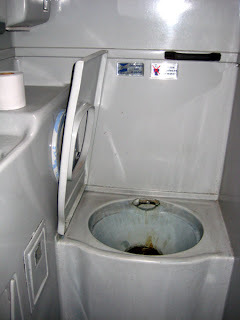 Bus toilet, the seat flips up to keep it dry. 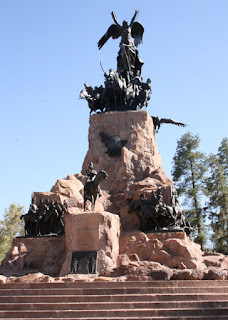 Andre and I decided to stop off in Mendoza, Argentina on our way to Santiago, Chile for several reasons. First of all, it’s right on the way, so it helps break up the trip. Secondly, I have several friends who are planning trips there so I figured there must be a reason why. 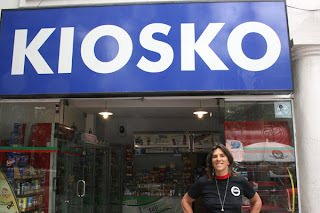 And lastly, we could take a comfortable night bus from Buenos Aires, then cross the Andes during the day. As it turned out, it was the right decision. The bus from Buenos Aires to Mendoza leaves at 7:45 p.m. and arrives at 8:30 a.m. Piece of cake, especially when you splurge on first class with the fully reclining cushy seats, dinner and breakfast included, movies and music videos. The only way to go! My first and lasting impression of Mendoza is that I’d somehow gotten lost and ended up in southern California where I grew up and my dad still lives. Dry chaparral, rolling hills, lots of trees, even tract homes. 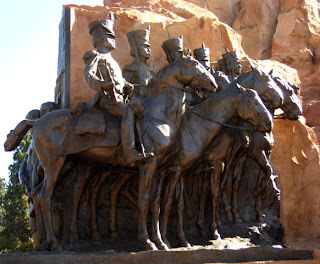 The city of Mendoza was founded by the Spanish in the 1500s, but got leveled in an earthquake in 1861. When they rebuilt it, they did it with little charm, using a north-south-east-west grid and seismically sound buildings. But at least they left room for lots of plazas and planted trees everywhere. Mendoza, the third largest city in Argentina, with a population of 1.8 million, has enjoyed a surge in tourism over the past 6 or 7 years. The real attraction, however, is not the city itself, as we found out on a 3-hour city tour, which ambled around non-descript streets, while our charming guide pointed out mediocre attractions like a neglected park that doubles as a red-light district. The highpoint, both figuratively and literally, was a stop at the mountaintop overlooking the city, crowned by a military-inspired sculpture, which of course Andre loved. His grandfather who he adored was a soldier and Andre’s always dreamed of being in the military too. 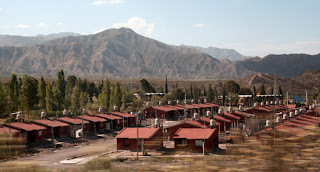 Most people go to Mendoza for the activities surrounding the city. In winter, there’s skiing and snowboarding and in summer (which is coming up in a week or so) there’s wine tasting tours, rafting, horseback riding, hiking, mountain biking, and kayaking. We decided to try rafting even though the water level was low and we could only take a 45-minute trip down a 1.5 class river. 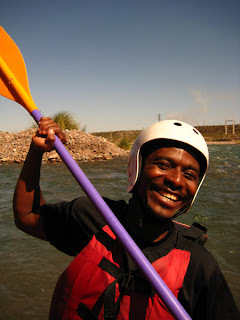 Andre had never rafted before and I’d only done it once with Maya in Montana when she was two years old (so you can imagine it was a pretty lazy river). We shared our raft with our guide Sebastian and a businesswoman from Buenos Aires who had a break between meetings. Three American grad students opted for “sledding” down the river – definitely a challenge with the water barely skimming the surface of rocks at times. Needless to say, we loved it. My only complaint was it was over way too soon. In the distance, Andre got his first glimpse of snow on El Plata peak in the Andes. Another highlight of Mendoza was discovering the Guadalajara Grill. Gabriel got Andre hooked on fajitas in Montevideo, so he ordered them for dinner twice and lunch once. 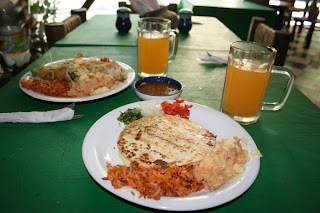 The Guadalajara Grill even makes their own corn tortillas and they import chiles from Jalisco, Mexico. The owners are originally from Guadalajara, but now live in Texas. They even surprised me with a carrot salsa, something I’d never seen before.